Swedish cable operator Com Hem has tapped German technology company WISI to provide its compact Remote PHY Node LR45 following an international tender. Com Hem will use the WISI product as part of its upgrade of the company’s HFC network to Gigabit broadband speed with a Remote PHY solution. Some 40% of Swedish households, or more than 1.9 million, are connected to the Com Hem network. The company launched its first high-speed consumer broadband service in 2013 with speeds of up to 500Mbps and presently offers up to 1Gbps. WISI says it was chosen by the cable operator thanks to availability, cost effectiveness, high product quality, high quality in logistics and excellent operational performance, and its compatibility with the virtualized end-to-end CableOS CCAP solution of Harmonic that Com Hem is implementing throughout its RF network. 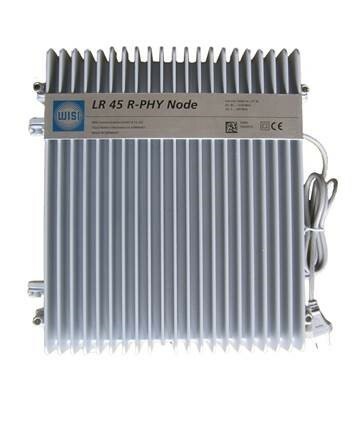 The LR45 is an in-house development and part of a broader range of gigabit solutions from WISI. “We are proud we were selected by Com Hem. The deployment of LR45 is an important strategic step forward for WISI in supporting the migration of HFC networks to Gigabit speeds across the Europe. We are consolidating our market position as a leading partner and vendor to European Cable and Telco MSOs,” said Thomas Scherle, WISI’s director of sales CATV/HFC Europe. “As a technology driven company, we are interested in long-standing partnerships with market-leading providers of price efficient amplifiers, nodes and other HFC materials. For decades, WISI has been known in the market as a reliable supplier of state-of-the art solutions and products and meets all of our high expectations,” said Jens Persson, Com Hem’s manager, tech-ops, HFC network.